Packaging should tell you. Typically .010 intake/exhaust. Or, .012 on exhaust to be safe. Still, check with manufacturer if info is lost. "The .280 has extra lift for better top end. This cam is a great touring camshaft and will pull the hills with the best of them. .010 tappet setting"
I thought you could only run that tight if you don't have stock valves. Just what I think I heard. I don't think anyone would rebuild and use the original cast valves Dave. 10 & 12 are good to go. What's your thoughts about flathead V8 valves, Frank ?? I don't think they are cast, but not sure. I have them in mine and adjusted them tighter than original, but not that much. Dave, they would be steel, 10 & 12 are fine. Thanks Frank, I will be snugging them up this winter. be careful with that. Is your cam an original cam? Or a new one? Not so, Ford set the clearance by thickness gauge, the setting of clearance by piston travel for worn cams was a KR Wilson thing. I set both intake & exhaust at .010" in accordance with the information provided with the Stipe 280 cam that I installed over 10 years ago. The valves I used were chev. exhaust valves/retainers/keepers using model T springs. 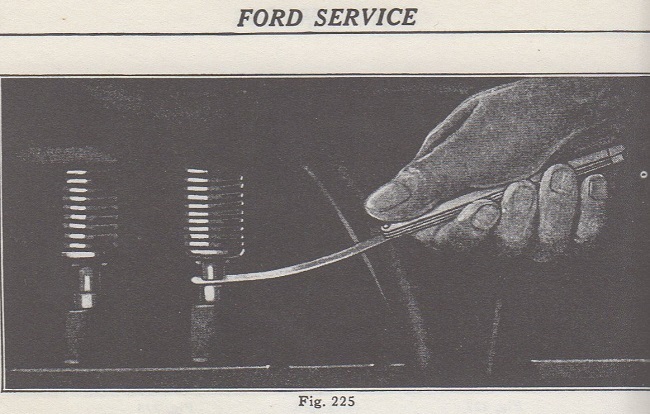 my point exactly...Ford set clearance by thickness gauge (one thin dime? )...you cannot arbitrarily go to .010" on an original or worn cam, and then assume that events will be correct much less improved. That only goes for a new or reground cam that has been designed for .010 clearance. I think we're both in agreement, are we not? Event timing is not going to change significantly, IMHO. I believe it's a stock cam, .250" lift, most likely an OE. I can't imagine anything but improvement, the less clearance you can get away with, without burning valves. When I adjusted mine, some were .060"-.080" !! An extra .030"-.050" is a big reduction in lift, when you're dealing with .250". The clearance is mainly there to make up for heat expansion, so the valves close properly when hot. I did find when Ford adopted the practice of the piston travel setting of valves, Dec 1924 with the full instructions issued for a worn valve train in a Service Bulletin in Nov 26. Although it was around in the early teens, Ford was reluctant with new ideas, another good example was the in-car magneto charge, Ford condemned that up until around 1926 when a KR wilson built testers and chargers for Ford dealers. I really can't see any benefit in the Event timing on a worn valve train myself, to much clearance and less lift and to tight burnt valves. I'm with Dave on this one, it's more about the heat exspansion than preformance. I think that one thin dime thing was more shade tree than a Ford spec on clearance, tooling wasn't that primitive back then at a factory production level or a good dealer ship work shop. I must apologise for the "thin dime" thing...that was associated with spark plug gap, and I wasn't thinking. It's not too far off though regarding early specs from Ford for valves, though where they (at least in 1913) recommended no more than 1/32 and no less than 1/64" clearance on valves with an admonishion that more would affect valve events and less could result in burnt valves. I think this is one time that original materials were vastly inferior to today's products (valves). Damn, 1/32" is loose as a soup sandwich ! I read that the factory clearance was greater because of the expansion differences in materials, the factory valves having cast iron heads. That difference in expansion I'm sure stresses them out causing them to fail. 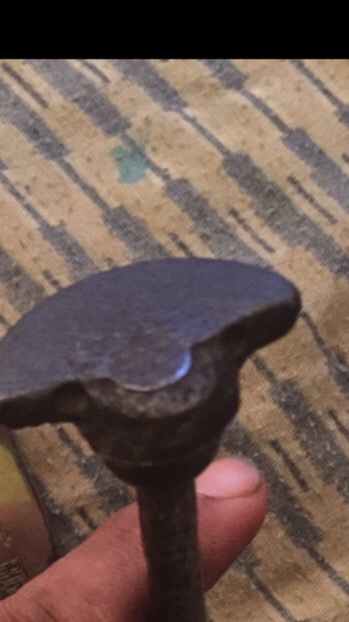 This one came apart on me a long time ago. #4 exhaust, pieces were in my muffler.